Hydro Energy is a renewable energy resource that uses the movement of water to rotate a water turbine or waterwheel which in turn produces a rotational mechanical output. The potential energy of the moving water is released as work because the water is in motion and the best way to put large amounts of water in motion is to let gravity do the work. Then the most important element for the production of “Hydro Energy” is not the water itself, but gravity, as it is gravity that makes the water move. Then we can correctly say that hydro energy is gravity powered energy as we are generating electricity from gravity. Hydroelectric power is a clean, natural power producing no carbon dioxide or other harmful emissions compared to burning fossil fuels and/or gas. Hydroelectric power generated by the force of moving water can be less expensive than electricity generated by fossil fuels and hydrocarbons. The disadvantage of hydroelectric power however, is that large concrete dams are required flooding large areas of land to obtain the vast quantities of water required to rotate the turbines. The theory of hydro energy is very similar to that of wind energy but instead of using the wind to rotate the turbines blades, we use the constant flow of water. Previously water turbines had only been used for the pumping of water or for the irrigation of land, but due to technological changes over the last few decades, we can now use water turbines to generate electricity not only on a large industrial scale but at home in the form of small scale hydro power systems. 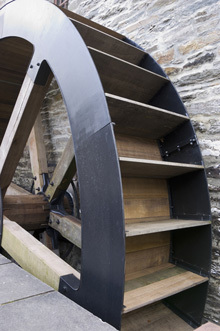 The moving water rotates a water turbine or water wheel thus converting the kinetic energy of the movement of the water into a usable mechanical energy. This is then turned into electrical energy through the use of a generator. The amount of electricity generated is determined by how far the water falls, called “head height” and the average volume of water flow. These “run-of-river” small scale hydro power plants can be very efficient and very simple to install if there is running water near your home. For most people it is highly unlikely that they will have a small stream or river big enough to provide a good enough source of water flowing through their land which could be used to power even a small scale hydro power system. But if you happen to be one of the very lucky few who have a reasonable size stream running past your garden or land then a small scale hydro power system may be for you as building even a small dam and adding an electrical generator in a reasonable river can provide a good amount of energy for your home. In most cases, the natural flow of the water is more than enough to generate a good supply of electricity for the home but in other cases, a funnelling of the water along canals and penstocks may be required to increase the waters speed and therefore its potential energy output. A colossal water wheel lowered from existing bridge structures, with the paddles submerged for optimum rpm. This paddle would look like the paddle wheels of an old time river boat, only they would be cupped and always remain vertical while submerged. The large gear on the wheel would transfer to a much smaller gear above to generate sufficient RPM for power generation. These structures could also be placed on barges anchored in the river. Of course, these stations would be out of the navigation routes. The weight of water moving in mass at a 4 knot current represents a great deal of energy… why not tap into this resource that represents 100% clean energy. We must think outside of the box to find solutions to the looming energy crisis that is clearly about to impact our lives in a negative way… perhaps at a catastrophic level.